We arrived on the Island after driving 4.5 days and 1,900 miles. The first challenge was to find the Cornwall/Charlottetown KOA. The address was in the GPS but not the name. There were 3 listings with same address and the one I picked was on a dirt road and no KOA in sight. I called them on the phone and after much discussion I was told they were another hour and half drive away. The next mistake I made was to arrive on Civic Holiday so the park was jammed with RVs and kids. They did have the space I had booked. Much of the drive here was on I-80. It is in beautiful condition and easy to drive with its 65 mph speed limit. I was also amazed at how few cars exceeded the speed limit. From Scranton to Maine you are on 81, 84, 295 around Boston, and then 95 through Maine. Of course 295 was bumper to bumper for at least an hour. We crossed the border at St. Stephen, NB. My father lived here while in high school. My grandfather was the Bank of Montreal manager and the family lived in the upstairs rooms of the home on the right. My father was a friend of Whidden Ganong who ran a famous chocolate company named after his father which is still going strong under David Ganong. The building on the left. We had a tour of a museum there with all the free candy you can eat. After doing the laundry in downtown Charlottetown we had fish and chips at the Brit Fish & Chips Restaurant. If you order one fish you get two large strips not one. They were very good but too much to eat. From downtown we drove north to the #1 attraction in the province, the House of Green Gables. It became famous because of a novel with the same name written by a young girl, Maud Montgomery, in 1908. It is well worth a visit to learn about life in the early 20th century. We cancelled our second day at the KOA and stayed in a beautiful town park at St. Peter's. Today, we went a short distance to Greenwich National Park and learned in the interpretive center that 12,000 years ago this area was covered by ice as in the photo. PEI was not an island but connected to the mainland. As the ice melted the water level rose and PEI became an island. Then we walked 4.5 km (2.7 miles) round trip to the sand dunes and beach on the Gulf of St. Lawrence. There is a very long floating board walk on the way to the beach. 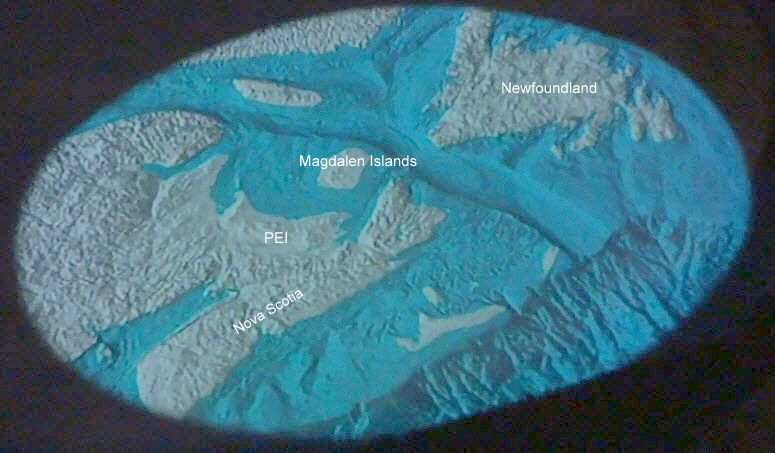 Its 85 miles by water to the Maggies (local term for Magdalen Islands). We are now in the parking lot for the ferry which leaves at 2:00 AM and arrives at 8:00 AM.